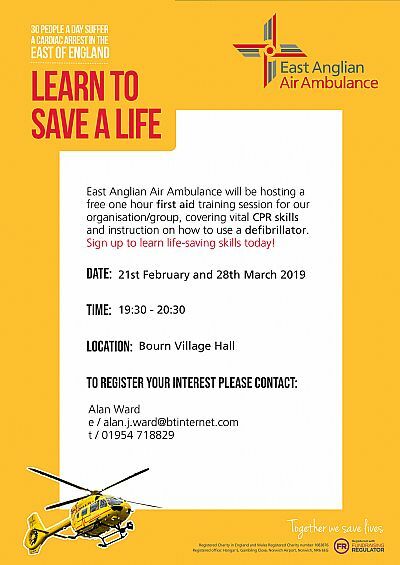 Now that the new defibrillator has been installed outside the Village Hall, the East Anglian Air Ambulance in collaboration with the Parish Council has arranged for two free basic first-aid training sessions to be available. This will include instruction on how to use a defibrillator. This is open to all residents and, in view of the tragic event at the village shop last week, it's hoped that everyone will want to know more. If you can't get there - make sure your neighbours can. No-one ever knows when such skills are going to be needed, or when. It's possible to get a hundred people into the Village Hall. We hope the demand is such that, not only can we fill it on both sessions, but need to organise more! The Parish Council is now looking at raising sufficient funds to install a second defibrillator elsewhere in the village. Please contact Alan Ward (01954 718829 or alan.j.ward@btinternet.com) for more information and/or to register your interest in the training.